Fat and Happy Blog Tips and Techniques: Using Napa Cabbage will help to keep this coleslaw more tender. 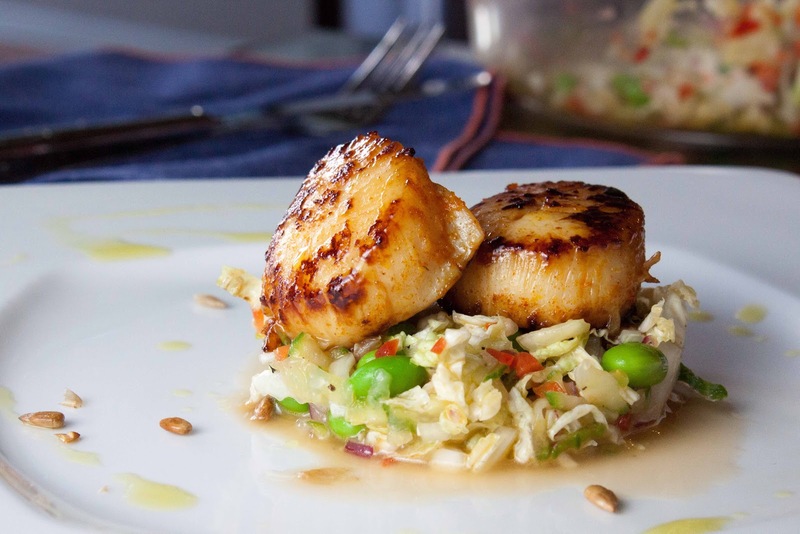 Using a crunchier cabbage would be too chewy for the light and tender scallops. Please take a moment to look at my fellow swappers creations at the bottom of this page. Grate the cucumber and thinly slice or chop the cabbage. Place in a strainer, salt liberally and let stand to help remove its water content which will keep the coleslaw from becoming soupy. Next, in a small sauce pan, mix together the orange peel, 2 tablespoons of orange juice, paprika, brown sugar and ginger over low heat just until the until the sugar melts. Cool. Place in a shallow dish and let the scallops marinate in the mixture for 20 minutes while you make the coleslaw. While the scallops are marinating, whisk together the orange juice, vinegar, olive oil, sugar and wasabi powder together along with a pinch of salt and pepper, set aside. Cut the remaining vegetables and toss with the wasabi dressing and the edamame. Add in the strained cabbage and cucumber and toss well. Allow the coleslaw to sit for at least 10 minutes before serving for the flavors to meld. Remove the scallops from the marinade. Either grill or pan fry the scallops, this should only take a few minutes per side. If grilling, rub the grates with a little oil before setting the scallops on them. If pan frying, add a little canola or peanut oil to the pan and cook over medium high heat until each side is seared. To serve, place a scoop of wasabi coleslaw in the middle of the plate. Top with a grilled scallop. Drizzle the plate with olive oil. Add a couple of toasted sunflower seeds or wasabi peas. 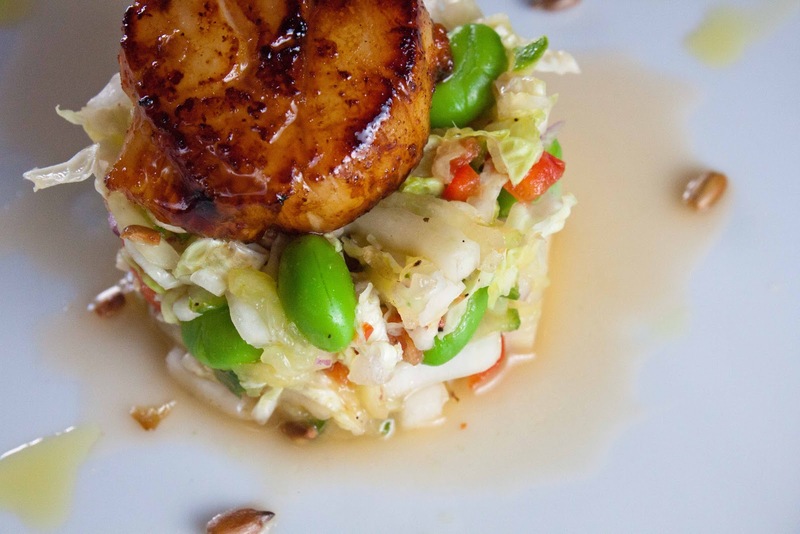 Enjoy while the scallop is warm. Serves 4 with each person receiving 2 scallops. 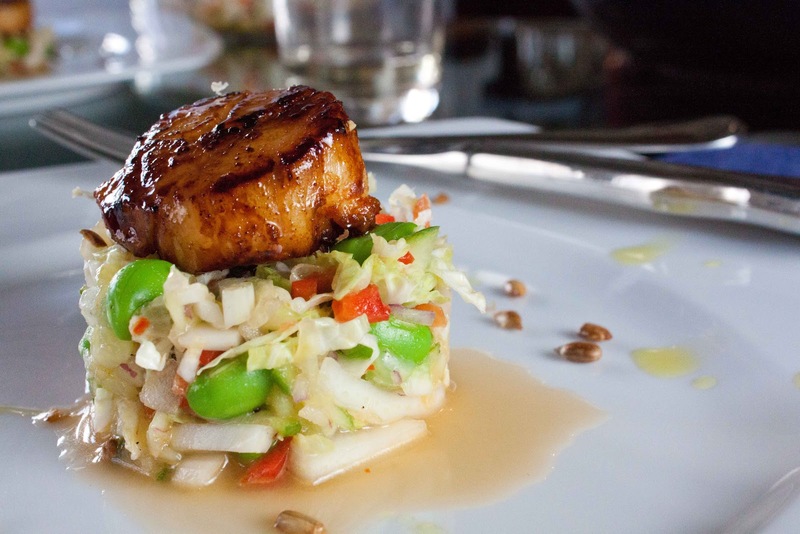 Or serve as an appetizer with 1 scallop per person. Oh Monique, those scallops look heavenly. I'm a sucker for scallops, but pairing the wasabi, orange and ginger is killer. Great swap!